A tiny alien luxuriates in my bowl of chicken vegetable soup. He even brought his own towel. For years, reports of sightings of tiny aliens have been trickling in from all around the globe. Mysterious little creatures, some only a few inches tall, have been turning up in Russia, Mexico, Peru, Chile and other countries. Their appearance varies considerably, from rubbery doll-like figures with a vague resemblance to Sesame Street characters all the way to shriveled, desiccated husks that look like some sort of stale cosmic kippers. Well it just so happened that I had just prepared a bowl of chicken vegetable soup and was getting ready to sit down to enjoy it. 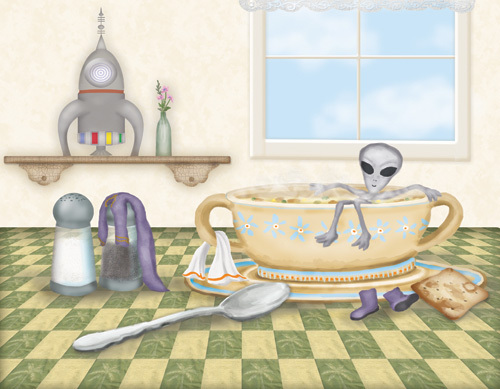 Before I could even get to my chair, the little alien shimmied up the table leg and quickly removed his spacesuit and boots, draped his towel over one of the handles on the bowl and jumped into the steaming liquid.